google-site-verification: google8d8438b214143f71.html Beautiful Quotes: We Should All Know These 10 Things About Our Blood Type! Blood type can be a valuable clue for understanding your own uniqueness. 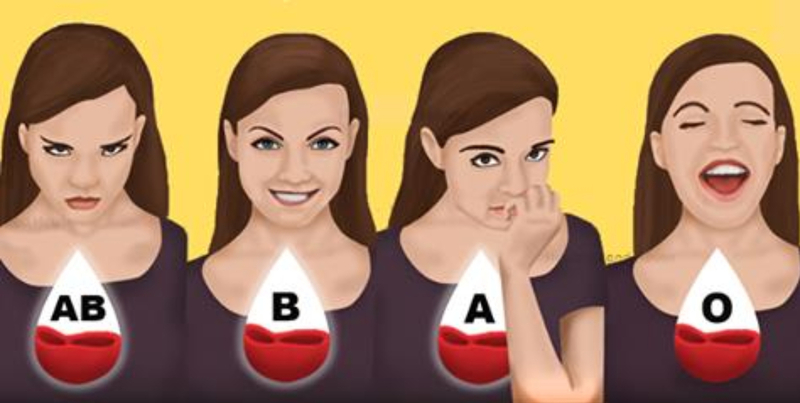 There are four blood types: A, B, AB, O. Each blood type has unique characteristics which can affect weight loss, certain diseases, and even the personality. Below are some interesting facts you need to know about your blood type. In Japan, blood type is more important than zodiac sign. Many Japanese people believes that blood type determines personality traits, temperament, and compatibility with others. That’s why many people in Japan often ask “What is your blood type?”. Those with Type A blood type tend to be kind and compassionate individuals who put others’ interests and needs before their own. They can have a stable love relationship. Type B blood is often found in individuals who are outgoing, friendly and emotionally flexible. B Types tend to excel in things rather than just be average. But they tend to be so involved in their own world or become so carried away with something that they neglect other things. AB’s are Freedom-loving, strong and rational people. They don’t worry about little things and usually can assess their life challenges without emotions getting in the way. They can be seen as spiritual and even at times a bit “flaky”. Those with Type O are described as responsible, practical and rule-conscious and organized. They make excellent leaders and their determination helps them achieve their goals. Your blood type affects what food you should be eating. Type A individuals have a sensitive immune system. Recommended foods for type A people are carbohydrates such as rice and grain, vegetables, and fruits. A does not require meat consumption at all, since vegetables are more suitable for them. People with Type B blood tend to produce higher than normal cortisol (stress hormone) levels. As such, they should avoid trans fats, vegetable oils and alcohol. Type O people can digest meat easier than other blood types However, lack of protein tires them easily too. They require a high-protein diet with plenty of lean meat, poultry, fish and vegetables. Type AB individuals typically lack in stomach acid. They should consume things like apple cider vinegar and manuka honey to raise stomach acid levels and ensure proper digestion. Some people do not have to worry about belly fat, since their blood type guarantees that this will not be a problematic area for them. People with blood type A digest carbohydrates easily, so these people rarely have belly fat. On the other hand, due to more difficult digestion of carbohydrates, people with blood type O are more prone to belly fat. People with blood type A like challenges for their body and spirit, so they tend to perform activities for balance of these two such as tennis, mountain climbing, and martial arts. Stress is the main enemy for type B people, so slow exercise such as yoga is the best way to relax. The best exercises for type AB people are yoga and aerobics to let stress out. For type O people, exercises such as running and boxing are best. They improve the heart rate function and muscles and keep their hormone balance right. It has been documented that women with a specific blood type group have bigger chances of getting pregnant than other types. Moreover, women with AB blood type produce less follicle stimulating hormone which helps women to conceive more easily. Studies have shown that women with Type O blood tend to be the least fertile. 6. BLOOD DONOR AND RECEIVER CHART. Type O- (negative) blood is called the universal donor type because it is compatible with any blood type. Type AB+ (positive) blood is called the universal recipient type because a person who has it can receive blood of any type.